. sake 鮭　legends about the salmon . Salmon pair called 大助 Osuke (or Daisuke) and 小助 Kosuke, “big one” and “little one. These are common names in the Tohoku region of Japan. Especially in the 15th day of the 11th lunar month the local fishermen have to take a day off in ritual respect for the animals. They take away the salmon catching traps and nets and open the river for the fish to pass upstream for reproduction. 「鮭の大助今のぼるぞー」. 「鮭の大助今通る」 「鮭の大助今のぼる」Osuke is now going upriver! Osuke Kosuke ima noboru 「大助こうすけ今登る」"Here we come up, Osuke and Kosuke!" Whoever hears this call is going to die or have ill fortune, so there are various taboos in the region. 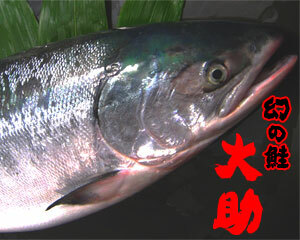 Once upon a time, the King of Salmons came up the Sakegawa 鮭川 Salmon River. Daisuke Kosuke nobore 「大助・小助・大助・小助」「大助のぼれ、小助のぼれ」on his way. The family kept many cows but every year a 巨鷲 huge eagle came by and snatched away a cow. They wanted to kill the hawk. The head of the Hanawa family disguised himself in the skin of a cow and waited. The hawk came down, grabbed him and flew him to an uninhabited island near the coast 玄界灘の孤島 into the branches of 老杉 an old cedar tree. The man did not know how to escape from the island and was quite scared. There an old man appeared. 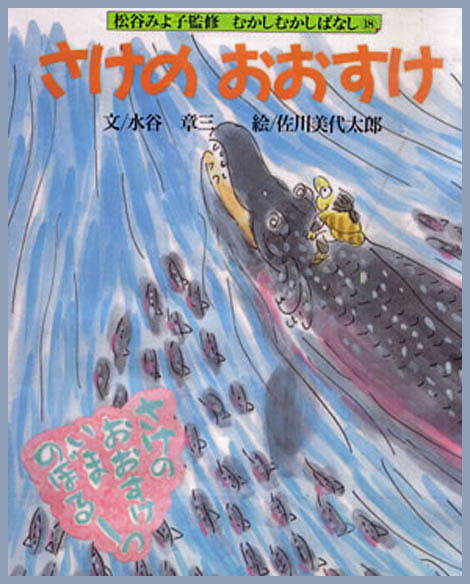 "I am the Salmon King Daisuke, head of a large family of salmons. Every year our family comes to the river 気仙の今泉川 Imaizumigawa on the 20th day of the 10th lunar month, going upstream to lay eggs and multiply. Since you usually let us pass, I will now help you!" The man from the Hanawa family could thus go home safely. Since then the head of the Hanawa family goes down to the river mouth, makes an offering of Sake and takes away the fishing nets, to provide an easy access for the salmon to go upstream. And all members of the Hanawa family never eat a bite of salmon. 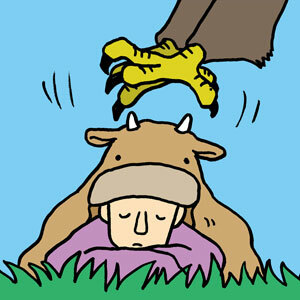 A variant of this tale tells that it was not a girl but a man who was carried away by an eagle. And the old man who brought his home from a small island off Kyushu to Iwate was none other than Sake no Osuke, Big Salmon." The masters [master & mistress] of the river were a conjugal salmon couple, called Osuke (Big Salmon) and Kosuke (Small Salmon). ... On that eve, Osuke appeared in his dream as a white-haired old man and asked for mercy." 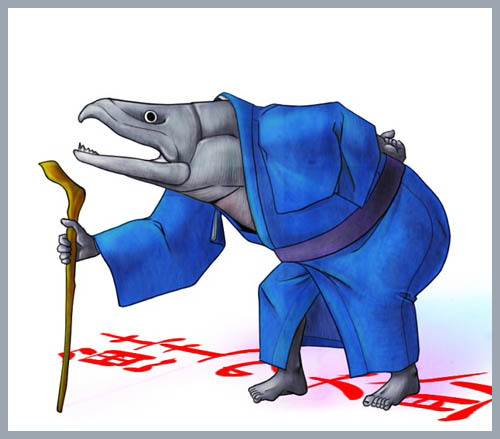 "the supreme commander of the fish army is none other than Sake no Osuke Hirenaga or Big Salmon with Long Fin, resident of Echigo Province, which is the present Niigata prefecture. Osuke ruled all the rivers flowing northwards." On the 15th day of the 11th lunar month people pound mochi 餅をつく rice cakes with a lot of noise, because Sake no Osuke is on his way upstream the Mamurogawa river. On the 15th day of the 11th lunar month the fisherman collect their tools to catch salmon and store them. オースケコースケ今上る Osuke Kosuke ima noboru. Anyone who hears this voice will die immediately. A man who was captured by a taka 鷹 hawk and taken deep into the mountain forest wa lucky on the 7th day of the 11th month. The King of Salmons, in the form of an old man, came to his rescue, taking him on his back on the way downstream. Now people beat the drums on the riverside so as not to hear the voice of the Salmon King and be stuck with bad luck. Osuke is sometimes calling, but whoever hears his voice has to die within 3 years. So people stay inside and drink a lot of sake and make noise. If anyone hears this call he will have bad fortune and especially children will get a sickness of the ears or even turn deaf. And whoever hears his voice has to die within 3 years. So people stay inside and make noise. 鮭の大助今のぼる」, whoever hears his voice will have bad fortune. 「大助今通る」to bring bad fortune, so children are put to bed early. 「鮭の大助今通る」, so people go to bed early as not to hear him. 「大助こうすけ今登る」"Here we come up, Osuke and Kosuke!". Anyone who hears their voice will die within 3 days. On the night of the 11th day of the 11th lunar month, the salmon fishing comes to an end at the river 最上川 Mogamigawa. On this night there is a ritual at the river, but people should not talk that night. If anyone sees Daisuke the Salmon going upriver, he will get ill.
... we have a pair of salmon named Osuke and Kosuke (“bigger and smaller man”). They are said to run upriver crying loud in human language, thus letting know of their yearly return. These brother pairs in Japanese cases can be compared with American parallels. Twin heroes in South American mythology are often hunters or are culture heroes who created game and fish for the mankind (Métraux 1946). Northwest Coast peoples have connected twin brothers or siblings with salmons in their customs and myths (Obayashi 1990). It is known that in many cultures twins have been associated with animal parents or deified with the riomorphic characters (Harris 1913, Sternberg 1916, Lagercrantz 1942). This would suggest that brother pairs and twin brothers partly reflect the worldview of hunting and fishing societies where humans and animals were considered nearer with each other. His wife is Kosuke 妻の小助（こすけ）.